Higher education and employers are constantly seeking ways to engage more closely in an era of student fees and with employability high on the agenda. Leeds Trinity University is no exception. This thriving institution is 50 years old this year having started out as a Catholic teaching training college. It has built on its heritage by putting its community ethos at the centre of its relationship with local employers. I caught up with Jess Sewter, Head of Partnerships and Placements, to find out more for the latest Learning to Leap podcast. The changes in the HE and employer landscape Jess has seen in her 9 years at the university. Professional work placements for both first and second-year students (the only UK university to offer this). Introducing Higher Apprenticeship Degrees at the university. 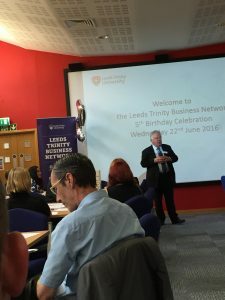 The highly successful Leeds Trinity Business Network community that celebrated it’s 5th anniversary last week. The co-location of businesses and students on campus in the Trinity Enterprise Centre. Why being a good citizen is at the centre of their employability strategy. 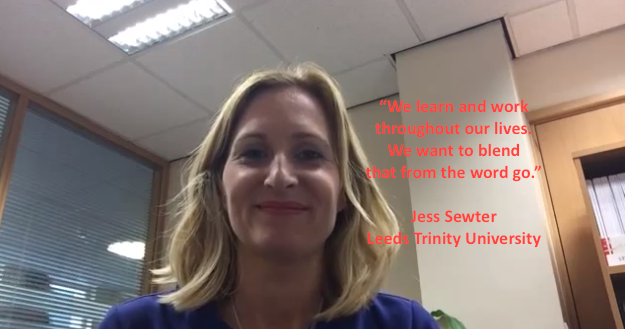 What Jess loves most about her job and Leeds Trinity University. I know you will find this podcast beneficial if you work in HE or you are an employer wondering how you can engage with your local university. Please feel free to connect with Jess on LinkedIn, directly via email – j.sewter@leedstrinity.ac.uk – or give her a call on 0113 283 7182.